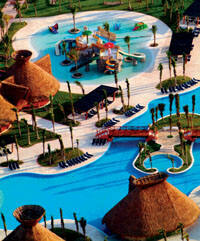 BARCELO MAYA - THE BEST BEACHES IN THE RIVIERA MAYA! BOOK YOUR BARCELO VACATION ONLINE TODAY! The lively all-inclusive Barcelo Maya Colonial Beach Resort is located on nearly two miles of sugar-white sand beach and is protected by an off-shore reef, close to the Xcaret and Xel-Ha eco-archeological recreational parks. Ideal for couples, families with children and groups of friends, this super active mega-resort offers an outstanding array of exceptional facilities including three large freeform pools with swim-up bars and Jacuzzis, a spa and fitness center, a wide selection of dining options, and a supervised children's club. Guests of all ages will delight in a host of included water sports and organized activities designed for fun in the sun. 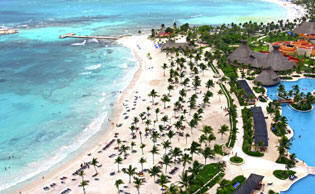 The beach at Barcelo Maya Colonial is a beach lover's paradise! Guests can lounge on the beach, snorkel in the coral, sail or swim. This beach has it all! 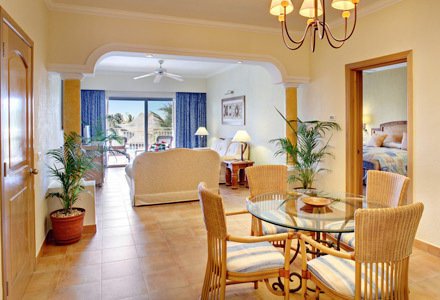 The Barcelo Maya Colonial and Barcelo Maya Tropical have a total of 948 Rooms (840 Standard, 96 Club Premium Sea View Junior Suites, 8 Suite* and 4 Master Suite*) between the two properties. Deluxe Room - Spacious rooms with terrace or balcony, fully-fitted bathroom, air conditioning, satellite TV, alarm clock, hairdryer, iron and ironing board, dressing gowns, coffee-maker, fan, minibar, safe, telephone with voicemail and 110-volt electricity, furnished with a king-size bed or 2 double beds and a single sofa-bed. Connecting rooms (on request). 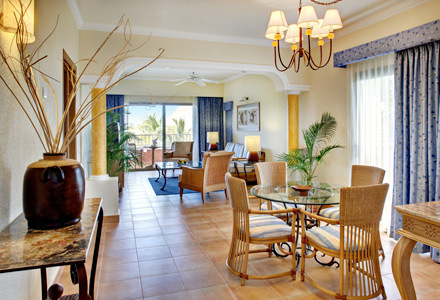 Junior Suite Deluxe Ocean View Club Premium Spacious rooms that face the swimming pools and beach. All the rooms include the CLUB PREMIUM package and feature invididual a/c satellite TV, alarm clock, hairdryer, iron and ironing board, dressing gowns, coffee-maker, fan, minibar, safe, telephone with voicemail and 110-volt electricity. 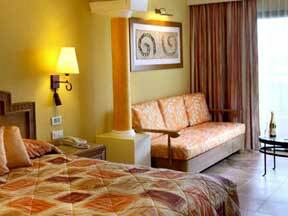 Furnished with a king-size bed or 2 double beds and a small living room with a single sofa-bed. Spacious rooms with terrace or balcony with views of the swimming pool and sea, fully-fitted bathroom, air conditioning, satellite TV, alarm clock, hairdryer, iron and ironing board, dressing gowns, coffee-maker, fan, minibar, safe, telephone with voicemail and 110-volt electricity. Furnished with a king-size bed, independent living-dining room area, bathroom and single sofa-bed. 70 m2 of space and a more intimate environment than the Master Suite. The bedroom suite offers a spectacular ocean view from the terrace at an angle. Has a large dressing room and a bathroom, a room with sofa bed, dining room and bath for guests, coffee maker and alarm clock, ceiling fan, iron and ironing board, minibar with drinks and snacks, digital safe, 2 flat screen televisions, executive desk and all the benefits of our exclusive Premium Club. The Barceló Maya Colonial Beach & Tropical resort is an ideal resort for families, couples, groups of friends, wedding groups and incentive travel. Located on the same spectacular beach and adjacent to the Barcelo Maya Beach, two hotels combine to offer one fabulous resort. Swim in either of two large 3 sectional pools both with swim-up bars. One pool is for activity, the other offers quiet ambiance with slatted sun shelters. Immaculately kept gardens filled with palms and flowers explosive in color, add to the overall beauty. Two buffet restaurants serve up a great array of choices offering nightly themes. Two snack bars by the beach are open all day. 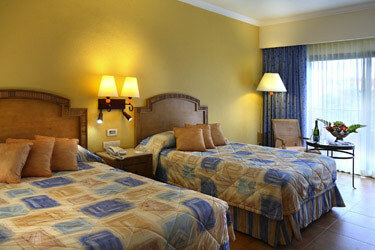 A great choice for family vacationers who love the beach, large pools and great buffets. Note: Coupon system applies for dinner dining in a la carte restaurants. Through the "Barceló All Inclusive" package, one of the most comprehensive in the Caribbean, it offers an excellent variety of facilities and services that will make your stay an unforgettable one. *A reservation and formal dress are required. For 7-night stays, you will receive 4 tickets valid for any of the restaurants. For 4-6 night stays, you will receive 2 tickets. Restaurants are subject to availability. Daily Activities: Lighted tennis court, Spanish lessons, dance lesson, water polo, beach/water volley- ball, basketball and ping pong, snorkeling, kayaking, diving, Sunfish Sailing, & windsuring. Kid's Club & Lucy's Miniclub offers a variety of activities and children's pool. The Barcelo Maya Colonial and Barcelo Maya Tropical offer buffet-style dining as well as a la carte dining. The two buffet restaurants are available to you for breakfast, lunch and dinner. The buffets offer a wide variety of choices suitable for the whole family to enjoy, and present different theme nights several times a week. The four a la carte specialty restaurants will be primarily available for dinner only but will offer Mediterranean-Italian, Seafood, Oriental and a Steak-House along with two beach restaurants that will offer meals during lunch and for snacks. Live shows are presented nightly in the beautiful 1,000 seat air-conditioned theatre for your entertainment. At the Barcelo Maya Colonial and Barcelo Maya Tropical, twenty-four hour room service is available at a three dollar service charge per plate. The two main Buffets are open for Breakfast, lunch and dinner daily and offer a huge array of choices to satisfy any taste! Featuring on-the-spot cooking stations, guests will enjoy the various theme nights presented several times weekly. Open-air restaurant under big thatched roof palapa serving casual lunch buffet and snack foods such as burgers, pizzas and salads. Air-conditioned fine dining a la carte seafood specialty restaurant. Dress Code: Long pants or dress shorts for men. Air-conditioned fine dining a la carte Asian specialty dinner restaurant. Air-conditioned fine dining a la carte steakhouse & grill restaurant. Air-conditioned fine dining a la carte Italian/Mediterranean restaurant. Refresh yourself in the pool with your favorite drink or cocktail at either fun pool bar. One in the Colonial section; one in the Tropical section of resort. Enjoy your favorite tropical drink or wine. Between the Lobbies of the Colonial and Tropical is the large of-the-moment disco, open from 10:30pm till late night. There is professional entertainment every night in the spacious air-conditioned theatre with shows and typical folkloric dances, accompanied by a live orchestra. Enjoy drinks during the show. Special Inclusions - Stay At One, Play At All - Guests staying at the Barcelo Maya Palace have full access to the complete Barcelo Maya complex as well as the opportunity of a "dine-around", which includes all the restaurants and bars of the neighboring hotels Barcelo Maya Beach. This includes all beverages (alcoholic and alcohol-free), both nationally-produced and imported. Consult your hotel upon arrival for details and restrictions.